"...Huge vats of fish oil and 50-gallon drums of oil exploded, spreading flaming oil over the plant...800 tons of codfish destroyed..."
In 1937, a roaring fire destroyed almost the entire Union Fish Company codfish processing plant along the waterfront in Belvedere. The facility was originally built in 1872, 65 years earlier. Many large structures were burned, including the canning, packing, and storage plants. The blaze was fought by the Belvedere Volunteer Fire Department and the San Francisco FD Fireboat John Scannell. We believe the Sausalito FD may have helped also, and are doing research to confirm this. 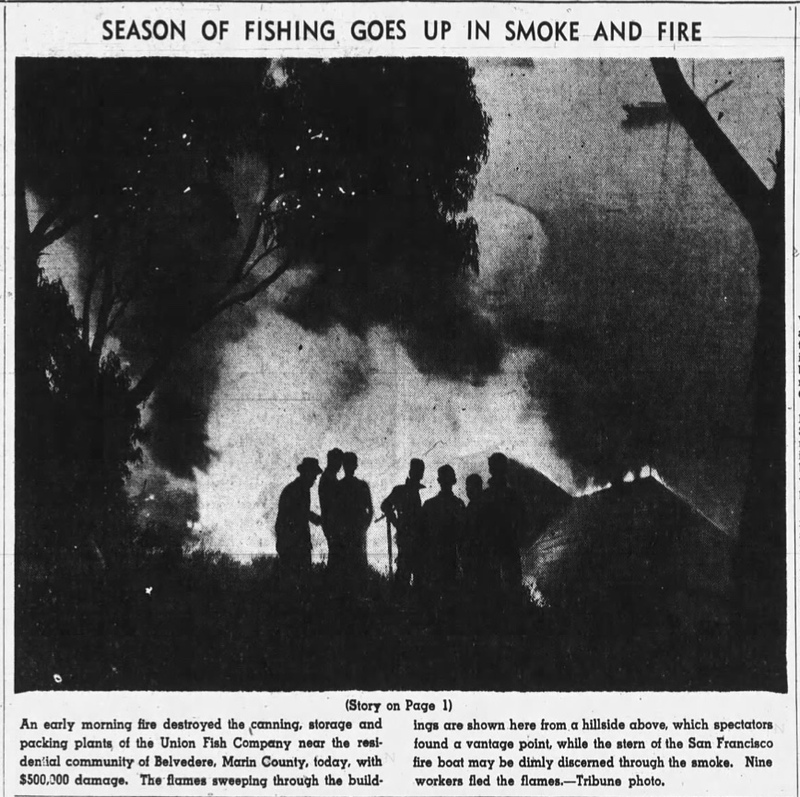 The Tiburon Fire District would not be formed until four years later in 1941. ​The Golden Gate Bridge had opened a little less than six months prior, with a toll of 50 cents. The equivalent loss was ​$8.5 million dollars in 2016. Roughly 18 months later, in May of 1939, the land was sold to the Belvedere Land Company for housing development - the end of one era, and the beginning of another. Note that the Union Fish Company is still in business today, celebrating their 150th anniversary in 2014. To read more about their history and to see historical photos, click the button below. Thanks to the Oakland Tribune for their story below.